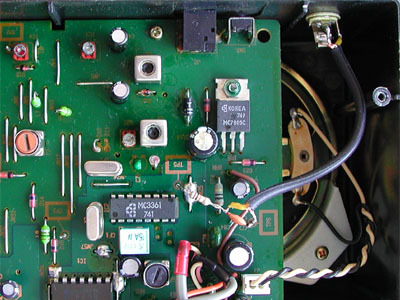 The advantage of this scanner is that there is ample space to perform the modification. Furthermore, there's no need to solder directly to the discriminator IC. 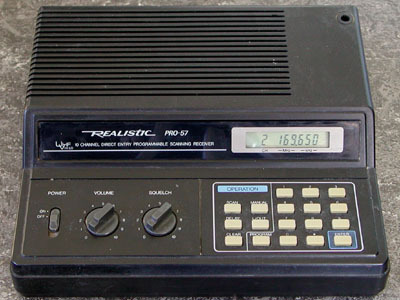 TP5 connects to pin 9 of the MC3361. This is where the baseband signal can be found. A 10 k resistor is soldered to TP5. TP6 is connected to the scanner's ground (GND). A 2.2 n capacitor is soldered to TP6. The other leads of the resistor and the capacitor are soldered together. 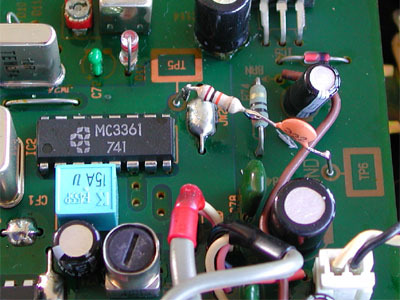 A piece of shielded wire connects the discriminator output to the outside world. 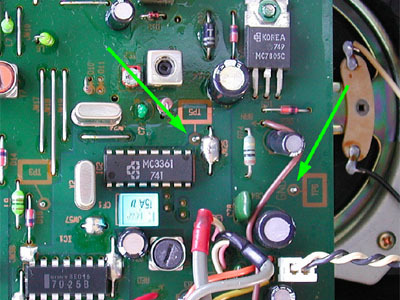 The inner conductor is soldered to the joint of the resistor and capacitor. The braid is soldered to ground (TP6). The other side of the shielded cable is connected to a 3.5 mm chassis terminal, which is mounted in the rear of the scanner.